With 2,700 employees worldwide, of which 1,400 work at our headquarters, we are one of the largest employers in the district of Rosenheim. We attribute our company's success first and foremost to our employees. We see every employee, irrespective of their role, as part of a whole. 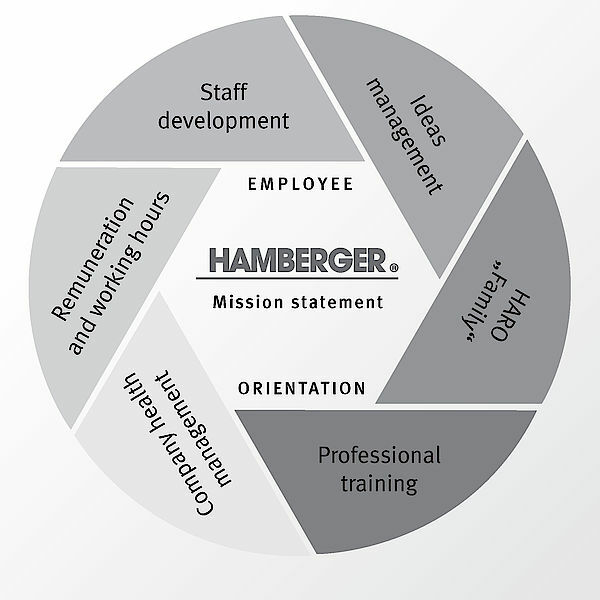 Therefore, our guiding principle for dealing with our employees is quite straightforward: only employees who are happy, who feel that they are accepted and that their contribution is valued can help shape and build the company. The aim of our staff development is to foster the individual professional abilities of our employees. For this reason, the continuous needs- and tasks-oriented qualification of our employees as well as the future-oriented development of their individual potential is particularly important to us. When planning and implementing actual staff development measures, we always address the specific requirements and needs of the participants, of the relevant divisions and of the company as a whole. In this way, our employees develop their professional, methodological, social and management skills continuously, accompanied at every step by an evaluation and optimisation process. Regular training and information events for employees in the areas of languages, EDP, health, products and work areas, self management and special topics for apprentices. Individually tailored courses as needed for the job requirements or for personal further qualification within the framework of personnel development. In addition to the desired and promoted daily employee talks, a fixed performance review takes place annually with the respective managers involving an appraisal and agreements.